Days of Our Lives (DOOL) spoilers for the next two weeks tease that several mysteries will unravel. The week of October 23-27 will bring some startling revelations. First, let’s talk about Eli’s (Lamon Archey) connection to Sheila (Tionne “T-Boz” Watkins). He’ll fill Gabi (Camila Banus) in on a secret about their complicated history. 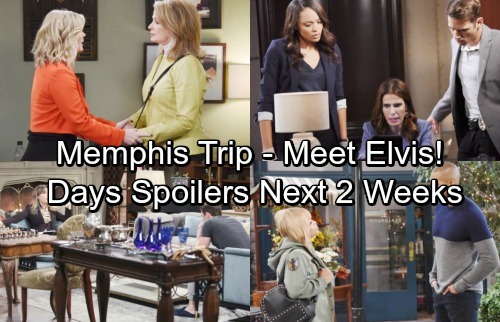 It appears Eli will also be roped into helping Sheila when Bonnie’s (Judi Evans) scheme explodes. Will the tricksters make it out of town undetected? Meanwhile, Adrienne (Judi Evans) will be relieved when Justin (Wally Kurth), Steve (Stephen Nichols) and Kayla (Mary Beth Evans) arrive to save her. She’s been stuck at Statesville for quite a while, so it should be good to get back home. Unfortunately, Adrienne won’t be able to relax in Salem for long. Thanks to new Will (Chandler Massey) clues, a search party will head to Memphis. Days spoilers say John (Drake Hogestyn), Marlena (Deidre Hall), Sami (Alison Sweeney), Paul (Christopher Sean) and Sonny (Freddie Smith) will all take the lead. Justin, Adrienne and Lucas (Bryan Dattilo) won’t be far behind. DOOL spoilers hint that Lucas might get his hopes up when he learns about the Bonnie and Adrienne swap. Alas, his dreams will be dashed again during the week of October 30-November 1. Adrienne will decide Justin is the one she wants to be with. Poor Lucas just can’t catch a break! Part of the Memphis gang will get intriguing info from a shady character. Since there was a leaked audition tape for a guy dressed as Elvis, there’s a good chance that fits here. Later, Days of Our Lives spoilers state that we’ll see a stunning encounter. Marlena, John and Sami will be taken aback by a familiar face. Since Susan (Eileen Davidson) once believed EJ’s (James Scott) father was Elvis, it sounds like she could be involved in this mess. Of course, we can’t rule out a Kristen (Eileen Davidson) return at some point. Let’s hope Days threw both comebacks in while they had Davidson on set. Sonny will have to be hospitalized during this stressful trip. The medical crisis could slow down the Will search briefly, but Sonny won’t give up. Back in Salem, Halloween will bring some spookiness. Chad (Billy Flynn) and Abigail (Marci Miller) will have a particularly creepy evening. Other Salemites will struggle through a frightful night, too. Serena (Melissa Archer) and Paige (True O’Brien) will both make appearances soon, so maybe some hauntings are on the way. Will their ghosts stir up trouble? We’ll give you updates as other Days of Our Lives news comes in. Stick with DOOL and don’t forget to check CDL often for the latest Days of Our Lives spoilers, updates and news.